Shu Gan Wan (Shu Kan Wan) soothes the Liver, circulates Liver qi, and aids digestion. Good for the sensation of being too full after eating and other Liver energy stagnation symptoms including abdominal gas, hiccups, belching, or flatulence. Other symptoms include poor digestion, loose stools, and poor appetite. Useful in liver-spleen disharmonies causing symptoms common to hypoglycemia. Helps with breast distension associated with PMS. Use 8 pills three time per day. 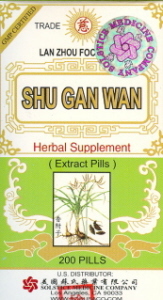 Contains: Cyperus (xiang fu), Paeoniae, Immature Bitter Orange, Immature Tangerine peel, Moutan, Citrus, Magnolia bark, Bupleurum, Citri Sarcodactylis, Citrus medica, Wen Yujin (curcumae) Rhizome, Amomum Villosum, Corydalis, Cardamon, Aquilaria, Sandalwood, Licorice.